They go by different names, like Drone, UAV, or Quad copters. They carry cameras, and take amazing video and stills from crazy heights. Every videographer and photographer wants one. The attack of the drones is upon us. I write this blog post to detail my journey, my pitfalls and the choices (or compromises) I have made. My journey began in September of 2013, when I purchased a DJI Phantom 1 from Amazon for $679. The idea was to use the drone to film fly-overs on corporate golf outings. Everything seemed simple; get the drone, drop a GoPro camera on the mount, and go shoot. And that is what I did. The Phantom 1 was a good craft, very easy to setup and fly out of the box, although I did have a small learning curve to overcome. The problem I had with this setup was the lack of smooth video. What I needed was a gimbal, like the Movi, but for small crafts. The gimbals was available, but some cost more than the drone itself, and all required taking the drone about, and soldering in wires. 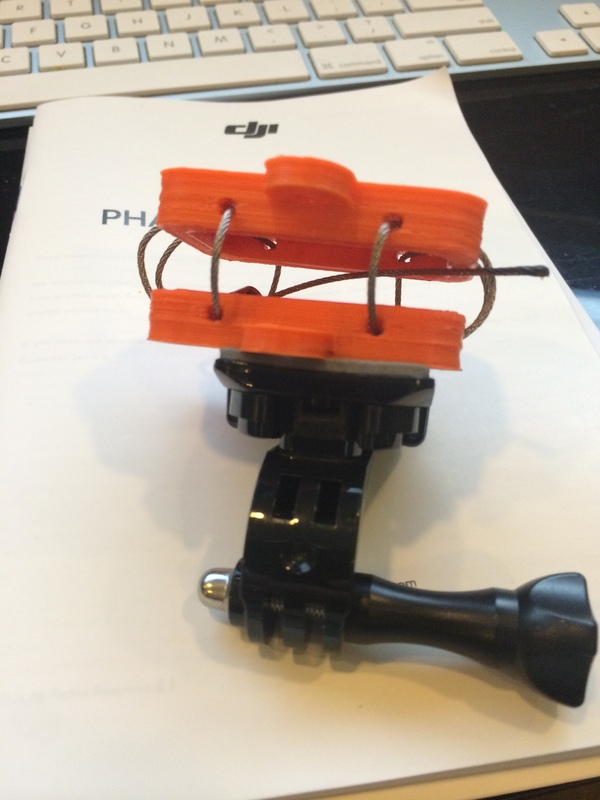 A 3D printed GoPro shockmount for the Phantom. I did try this simple, low cost, 3D printer contraption, but with only minimal improvement. Even the cheap gimbals (<$200) made a huge difference in the quality of the video as one of the members of the NJFCPUG demonstrated one meeting. All of this was a bit outside of my comfort zone, so I decided to pass on the gimbal option for the time being. To add insult to my injuries, DJI reduced the price after I purchased by $200, so I decided to return the unit, and chalk the whole thing up as a learning experience. Flash forward a few months, to April 2014 at the NAB Show in Las Vegas. DJI had a large booth in the main hall, and they had several new versions of the Phantom, but the one I was interested was the Phantom 2 with a 3 axis gimbal pre-wired. I purchased one right on the show floor, very anxious to get my hands on one. I only waited a week, as my drone had shipped mere days after NAB. While the video that my Hero 3+ recorded was stellar, I yearned for a way to live monitor what the camera was shooting. I needed a way to frame and orient the tilt axis on the camera. Again, DJI to the rescue, or so I thought. 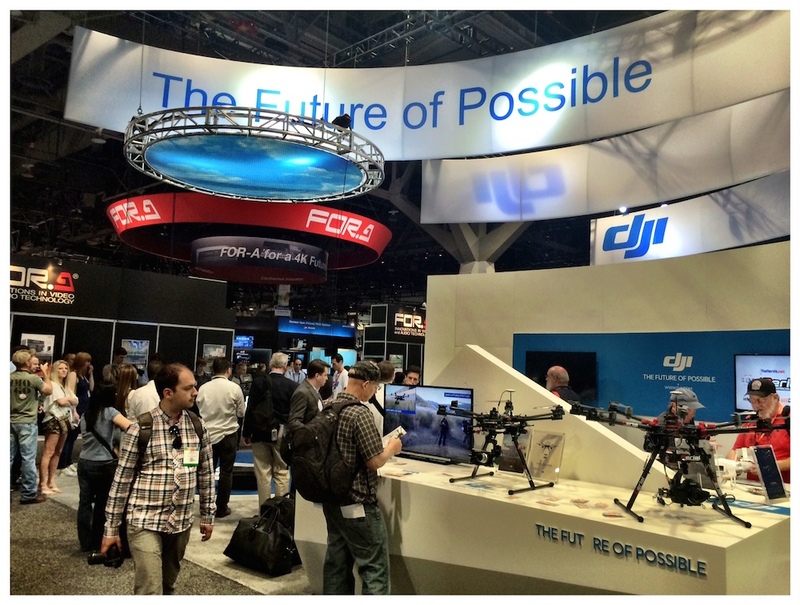 At NAB, DJI showed off a long range digital HD video transmitter for their drones. It was relatively expensive compared to the cost of a drone, at around $1500, and it was not available yet. I waited and waited, chewing through props all the meanwhile. DJI posted a few videos that show how great it worked, but they did not tell the whole story. The LightBridge works on the 2.4Ghz radio frequency, same as the stock Phantom flight radio. After installing the LightBridge on my P2, I quickly realized something wasn’t right. I could not control the motors or anything. Frustration begins. I tried calling the DJI support line directly several times, only to be told that due to high call volume, my call could not be taken at this time, and to try again later. I did try again later, numerous times later, with the same result. It appears that DJI just doesn’t take calls now. There are several dealers listed as well, and I called a few. All the ones I spoke to had never seen a shipping version of the light bridge, nor had they any answers to my questions. It turns out, that in order to use the LightBridge, you need to purchase a controller that can tether to the LB so the frequencies don’t interfere. So I purchase a Futaba radio that some others on the forums had recommended. That did indeed work, but the controller needed to be “programmed” to learn the phantom controls, and in the end, did not behave the same way in terms of easy of use. Most frustating was the lack of a Mac updater tool for the LightBridge. DJI has a Mac utility for the Phantom, so it does not seem like a stretch to expect Mac support for all of their products. After a week of kibbles and bits, I was able to get the LightBridge to work, and it worked well in my limited testing, but the setup was a bit gangly. Around the same time, i was watching some videos about the DJI Ground Station, and autonomous flight modes. With a couple of add-on pieces, you can literally plot points on a map, and allow the drone to fly by itself at user determined points. This was perfect for me on the golf course, being able to let the drone fly down the fairway without me screwing the flight up. So I ordered a Ground Station kit for the Phantom2, only to realize that it is incompatible with the LightBridge. Do you see a pattern here? Not blaming DJI or anyone for that matter, but the lack of clear and concise information on this is frustrating. Especially when the price point of this gear is aimed at green-horns. The Ground Station is amazing from the technology to the interface. I was able to plot a few routes and have the drone fly all by itself. It was a bit scary at first, but it worked. For me, this feature trumped LightBridge for my use. Shortly after NAB, my friend bought a DJI Phantom with an integrated camera, called the Vision. 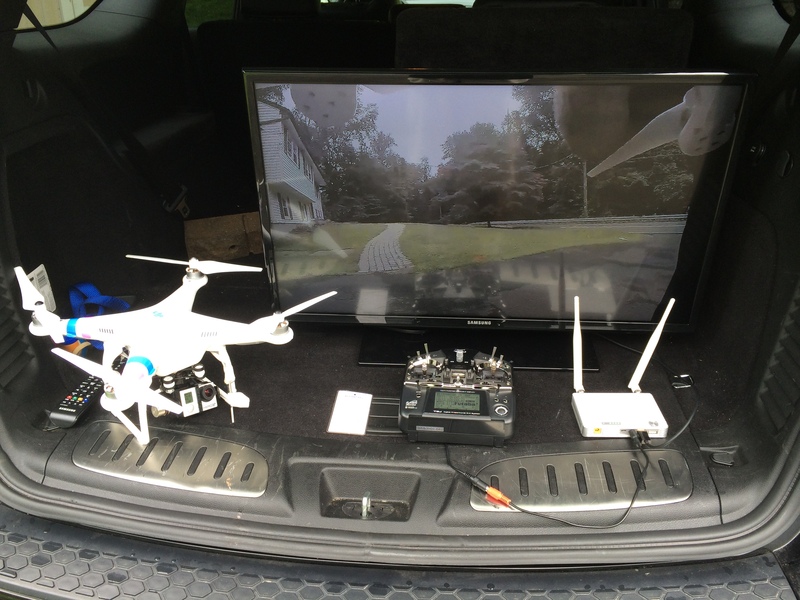 It touted a live video transmitter to an iPhone or iPad for realtime FPV. The idea was good, but for me, the lack of a 3 axis gimbal was a deal breaker. Enter the Vision+. The Vision+ is an update to the original Vision, but includes a re-designed camera AND a 3 axis gimbal. Plus, it includes the Datalink hardware in the unit. For me, this was almost all I wanted. Once again to Amazon.com to order. So the Phantom Vision+ arrives and I start the all to familiar drill of assembling, charging, and updating firmware on the drone. Once all was set, I went out to do some testing. Immediately, I had an issue the the drone not talking with the radio. Double checked everything, but no luck. Back to the support lines. Who would answer the phones first? Atlanta Hobby answered first, and the tech suggested I read the manual, which I had, about linking the controller to the drone. After a second call, another tech walked me through the steps. Still no go. Call DJI he says. HA! I really did not have time for a long round of call attempts, so I simply returned the unit to Amazon, and they advance shipped me a replacement. I figured it was worth a second attempt. The new Vision+ I am happy to say worked out of the box. My review on this drone will follow soon. The entry point for this technology is incredibly low for a professional user, which makes it very attractive. The UAV industry is at a crossroads now, where technology is developing by leaps and bounds. I would still categorize this like the wild west though. Every pro can buy one, but it’s buyer beware. Not just from the hardware, but also the law. The FCC says that these craft for professional use are not approved without licensing. That process is out of reach for most in the category. You may get away with it once or twice, but the law may catch up with you at some point. Then there is the safety element. I personally don’t fly my drones over people in a public space, and try to minimize the impact if my drone drops from the sky. Others do not take such precautions and those are the stories you hear on the news. As a matter of fact, I am launching a support group for video pro’s who are getting into the world of drones. Be safe, be patient, and have fun! This entry was posted in Blog, Gear. Bookmark the permalink.